The setup is fairly simple and looks as shown below. The serial Bluetooth adapter is connected to the hand control via a RJ11 to DB9 female cable. The hand control (serial port based only) is then connected to the telescope mount. This male/male connector is included with the UCBT232B and UCBT232EXA adapters. You will need this to be able to connect the Serial Bluetooth adapter to the RS232 end of the RS232 / RJ11 cable which is connected to the hand control. This cable is used for connecting the serial Bluetooth adapter to the hand control. This rechargeable lithium USB battery pack is optional but very useful if you have no other power source for the serial Bluetooth adapter. If your serial Bluetooth adapter's serial number is 14090200 or higher then the default baud rate is 9600bps which is also the default baud rate for most telescope mounts and you can continue with paring the adapter with your computer as described below. If your serial Bluetooth adapter's serial number is 14090200 or lower the default baud rate is 19200bps and you will need to first change it to 9600 before you proceed (please see the adapter's setup guide for how to change the baud rate). 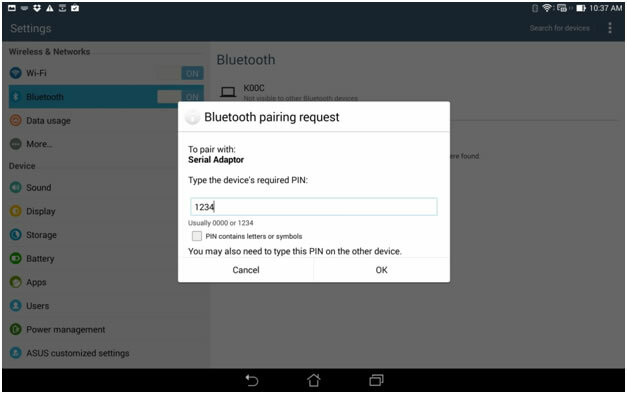 Now you need to pair the serial Bluetooth adapter with your tablet. 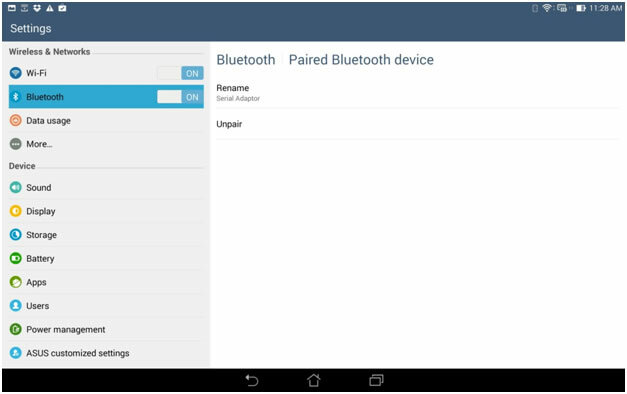 Depending on which tablet or phone you are using you may first need to manually turn on Bluetooth. 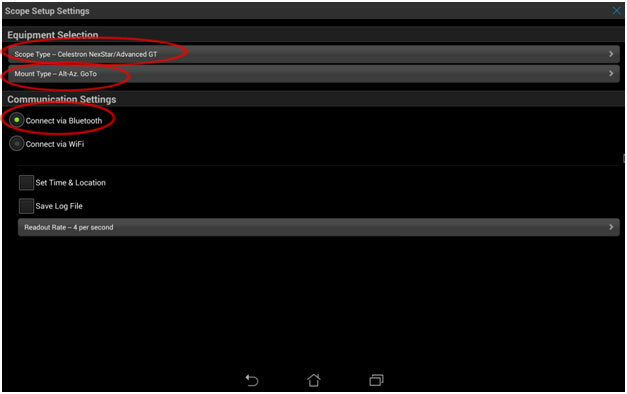 Some tablets/phones will automatically start searching for Bluetooth devices once you turn on Bluetooth, on others you will need to manually tab the “Search for devices” button. Click the “Serial Adapter” to pair it once your tablet/phone has found it. 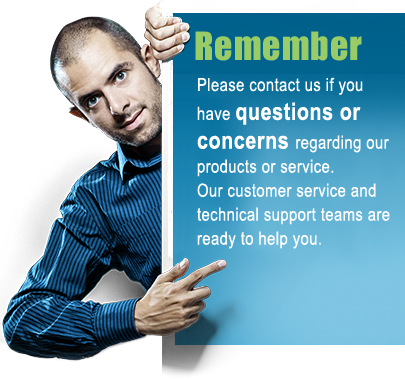 Please see the section called “Connection problems – Known issues” later in this guide if you are having problems with finding or paring the serial Bluetooth adapter with your Android device. Click the “Serial Adapter” again once its paired. If it says “Unpair” the adapter is now successfully paired with the tablet/phone. 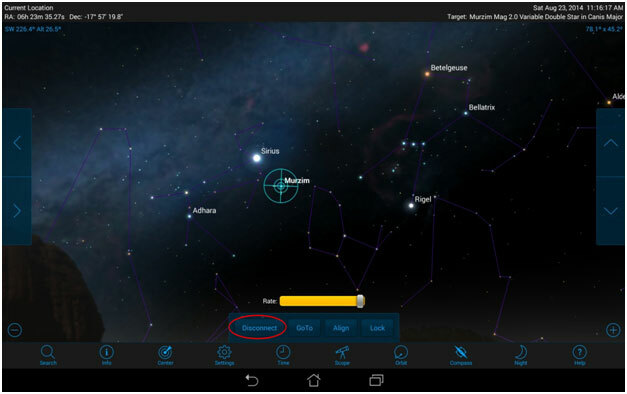 Align your telescope using the hand control. 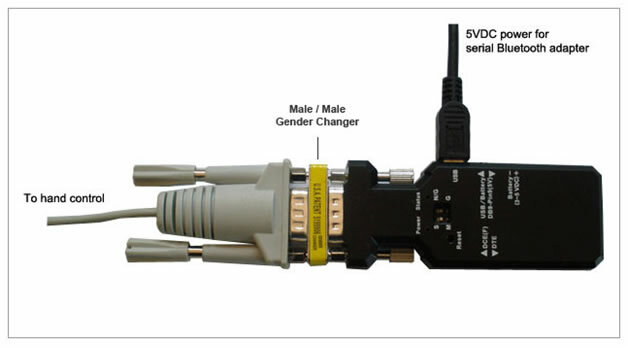 Connect the serial Bluetooth adapter to the hand control using the DB9/RJ11 cable and the male/male gender changer as shown below. NOTICE: The DCE/DTE switch on the side of the adapter must now be in position DTE. 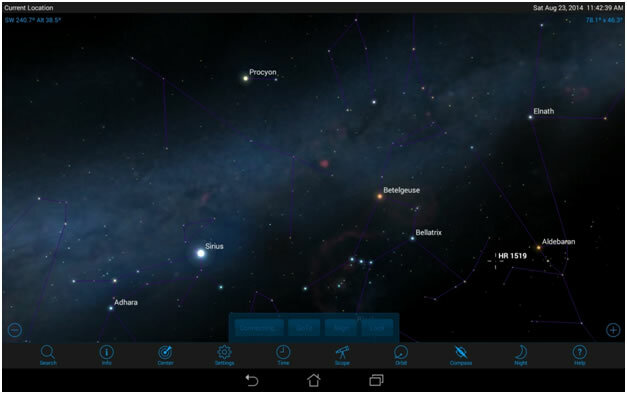 Install and open SkySafari on your Android device. Tab the Settings menu and select telescope and mount type under the Telescope menu. Select “Connect via Bluetooth” under Communication Settings. Once SkySafari has created the connection to the serial Bluetooth adapter the blue LED light on the adapter should be solid ON. Problem: Android “Can’t communicate with Serial Adapter” error. 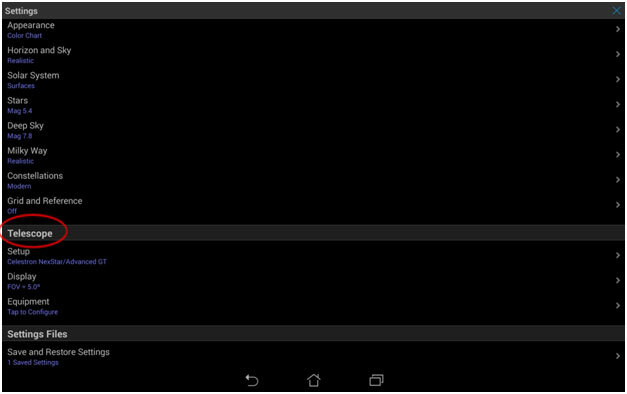 It is well known that the current version of Android (KitKat 4.4.2) has Bluetooth communication problems; however the severity of this problem depends on which Android device you are using. Make sure your Android can find only one adapter. 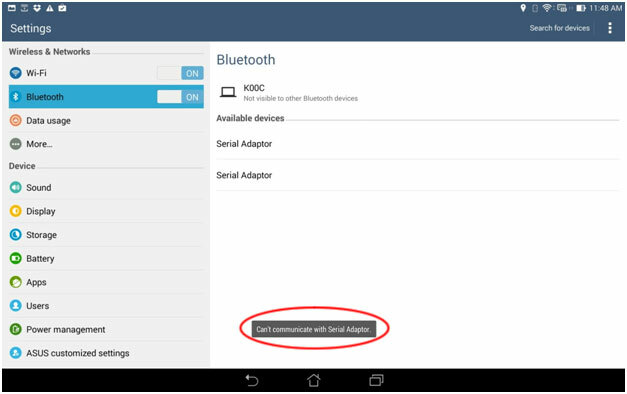 If two adapters are listed, remove one adapter by turning off Bluetooth, turn it on again and search for Bluetooth devices. 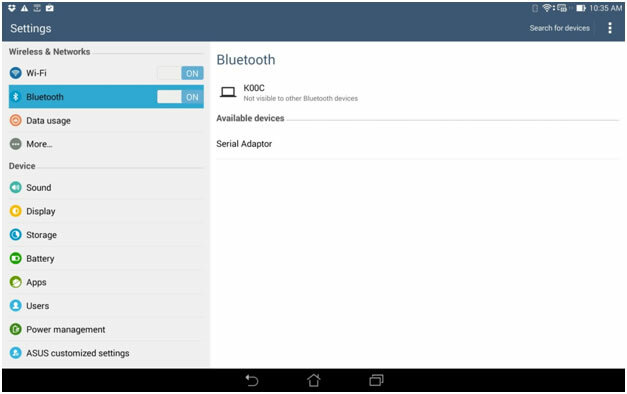 Unpair the adapter, turn off Bluetooth, turn on Bluetooth and search for Bluetooth devices. Unpair the adapter, turn off Bluetooth, reset the serial Bluetooth adapter (you will need to set the baud rate to 9600bps again), turn on Bluetooth and search for Bluetooth devices. Unfortunately there is currently no known way of completely solving this problem, except hoping that Google will fix this problem in the next Android update. Problem: SkySafari “Connection Failure” error. This problem is related to the problem mentioned above. 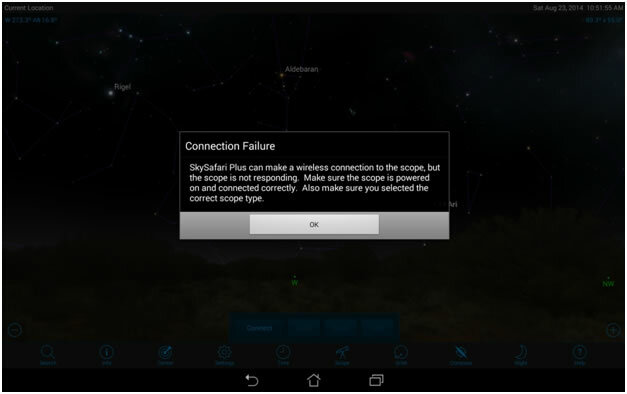 If you continue getting the "Connection Faliure" error window in Skysafari, even Android says the Bluetooth adapter is paired with your tablet, try and unpair the adapter, turn it off, turn off the Bluetooth in your tablet under the Settings page, turn the adapter and the Bluetooth back on after a few seconds, and search for Bluetooth devices and pair it again. Another reason you are getting the SkySafari “Connection Failure” error might be because you need to disable the ECHO and PROMPT commands in the serial Bluetooth adapter. Some customers have reported that the PROMPT and ECHO parameters in the adapter must be disabled to be able to communicate with SkySafari, however we have not been able to confirm this. With the Android devices we have tested this was not required.